With a wide range of content available, the University of Puerto Rico at Rio Piedras (UPRRP) was in search of an easy-to-use solution that would improve access and discovery of their library collections. 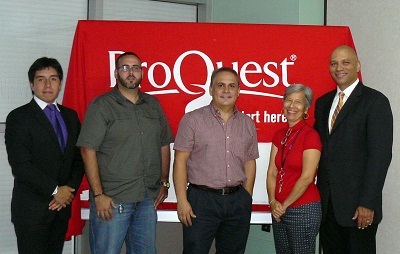 After evaluating discovery tools for nearly two years, the library system of UPRRP selected and launched an integrated solution from ProQuest - Summon service®, 360 Link and Syndetic Solutions™, to deliver an unprecedented research experience for their library patrons. The Summon service provides a superior search experience that delivers relevant and easily refined results across library collections. “It is a powerful tool that offers basic and advanced searching options with well-defined filters that guide users across formats, disciplines and dates,” says Marilyn. “The spelling corrector (Did you mean) is a valuable and much sought-after feature, along with the Database Recommendations and Best Bet features, which help students discover specific databases." Together with 360 Link and Syndetic Solutions, Summon brings rich metadata and full text from multiple sources to deliver the most comprehensive collection coverage for the university’s researchers. In a relatively short amount of time since implementing Summon, the library system of the University of Puerto Rico successfully configured most subscribed databases, several open access databases, and their OPAC and digital repository. Designed to integrate with a library’s OPAC, the addition of Syndetic Solutions enhances the library’s resource information with additional content and improves a title’s relevancy. “The ProQuest approach to discovery works for us,” Marilyn concludes. “We look forward to continuous growth and improvement across these services to maximize use of our collections and improve the research experience for our users."